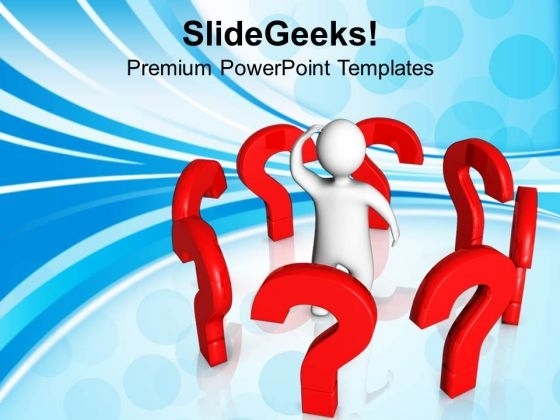 We present our Questions Around Man Business PowerPoint Templates And PowerPoint Themes 1112.Use our Signs PowerPoint Templates because,You know the path so show the way. Use our People PowerPoint Templates because, Our template will help pinpoint their viability. Use our Teamwork PowerPoint Templates because, You have the product you are very confident of and are very sure it will prove immensely popular with clients all over your target areas. Use our Business PowerPoint Templates because,Now use this slide to bullet point your views. Use our Marketing PowerPoint Templates because, There are a bucketful of brilliant ideas swirling around within your group.Use these PowerPoint slides for presentations relating to "Question mark around person, signs, people, teamwork, business, marketing". The prominent colors used in the PowerPoint template are Red, White, Gray Our Questions Around Man Business PowerPoint Templates And PowerPoint Themes 1112 never fail to amaze. They catch every eye that comes by. Achieve cross-functional team leadership with our Questions Around Man Business PowerPoint Templates And PowerPoint Themes 1112. They will make you look good.